For the second year in a row, Artesians have put their true colors on display when it comes to the Best of Artesia contest’s Best Nightlife category. And that color, of course, is orange. While many thoughts turn to local watering holes or entertainment options when it comes to nightlife, for a few fleeting but thrilling weeks out of the year, the place to be on a Friday night is not belly up to the bar but hands in the air to celebrate a touchdown. 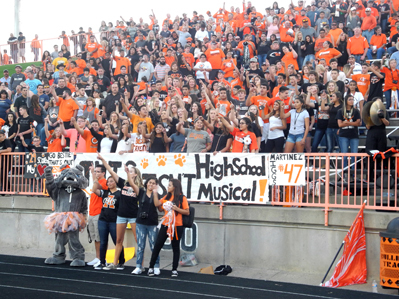 By yet another wide margin, Artesia opted for bleachers and blankets over pub tables and dance floors, voting Bulldog football to the top in honor of an evening out the whole community can – and does – get behind. “When you think about Bulldog football being chosen as the favorite nightlife, I think it says a lot about Artesia, N.M.,” Cooper Henderson, Artesia Public Schools athletic director, says. “It’s really exciting to live in a community where the school activities and athletics are such a priority. The fan support enjoyed by the Bulldog football program is well known throughout the state and beyond. The Sea of Orange begins flooding into the vast confines of Bulldog Bowl as soon as the gates open. The crowd is on its feet for the fight song, singing along with the alma mater, and shouting its support down to its beloved ‘Dogs as they take on all comers. Few high-school football teams can say their field boasts luxury suites in the press box. Fewer still have a museum dedicated to their program’s history on site. But that along with the Dogpile, the Victory Bell, the Victory Lane, the Championship Ramp, and the Pride of the Pecos Valley are simply part of what makes Artesia Artesia. “When you really think about what goes into Friday night football games, you see it is a great mixture of our community,” Henderson says. “No doubt the football team is what you see at the forefront and what you look for in the records, but no doubt the band also comes to mind immediately. Perhaps the perfect illustration of the spectacle the Bowl becomes on game nights was on display Aug. 26 when the Bulldogs hosted their season opener against county rival Carlsbad. In the 100th battle of the Eddy County War, an estimated 8,000 fans packed the stadium, standing along the railings that ring the concourse above the field when seats (quickly) became unavailable and welcoming football back to the community for another season in ear-pounding decibels. That they are in a unique position as high-school athletes is never lost on the Bulldogs themselves, either. The team is often awed by and never takes for granted the immense support offered by Artesia. Their record 29 state championships are a testament to what can be accomplished with not just talent and hard work but heart, pride and devotion. “We really appreciate the community of Artesia for being so supportive of Bulldog football,” head coach Rex Henderson says. “It really creates a great atmosphere on Friday nights, and I know that means a lot to our players. They really enjoy it.